The location of the Arrow on Swanston places you literally just a few steps from Melbourne's finest and most prominent commercial precincts, learning institutions and public transport. The Arrow on Swanston offers comfortable, convenient and value for money serviced apartments ranging from standard and deluxe furnished studio apartments right through to one and two bedroom apartments with all the space and facilities that you will need to feel right at home during an extended stay in Melbourne. This clean and comfortable budget serviced apartment accommodation is just a short distance from the many boutique shops, bars, restaurants and cafes in Carlton's Lygon Street, the Melbourne CBD and the Queen Victoria Market. At this long term serviced apartment hotel travellers will experience a distinctly indulgent and comforting atmosphere, which is perfect for discerning business guests, leisure travellers and families. All guest accommodation is stylish yet cosy and fitted with modern amenities including reverse cycle air-conditioning/heating, broadband internet access, cooking facilities and much more. The Arrow on Swanston is also equipped with modern facilities including secure undercover parking, gymnasium, sauna, outdoor swimming pool, conference facilities, luggage storage and a convenience store. The Arrow on Swanston is only a 5 minutes stroll to the free City Circle Tram and other public transport which can take you to tourist attractions, sporting venues and everything that Melbourne has to offer. 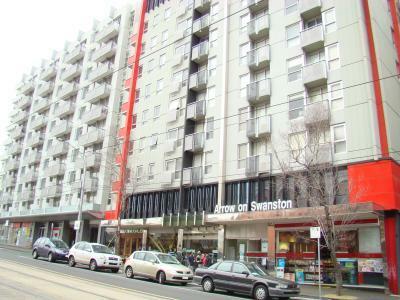 The Arrow on Swanston provides long term apartment accommodation in an excellent location that means guests are only a short walk from many of Melbourne's tourist attractions including the Old Melbourne Gaol, Queen Victoria Market, the State Library, Chinatown, Melbourne Museum and the IMAX Theatre. Also located close by is cosmopolitan Lygon Street which is renowned for its restaurants and cafes, the Melbourne Central & QV Shopping Centres, the university precinct including Melbourne University, RMIT and Trinity College, Melbourne's famous theatres playing the latest Broadway musicals and stage shows, the MCG, Etihad Stadium, Federation Sqaure and Crown Casino.